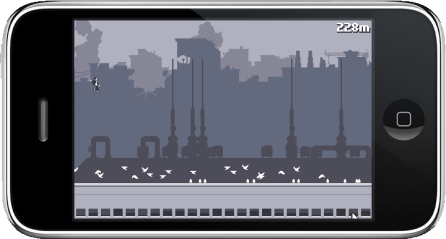 Discovered a rather fun little iPhone/web game today, curiously called ‘Canabalt’. There’s a screenshot of it below, which if clicked, will take you to the web page on which the game resides, as is customary in Internet Land. The idea is to click (or tap, if you’re on one of those fangled iPhone jobbers) to make the dude jump over gaps between buildings, fallen satellites, and if you want to keep his speed up, crates and that. Addictive and annoying, as such things always should be, I’ve managed 5442m at best. Go team!